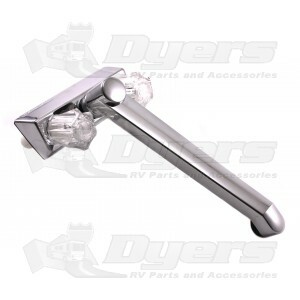 Utopia hi-rise chrome kitchen faucet with dual acrylic handles. 6-3/16" L x 2-1/4" W x 3-1/2" T at handles. Spout extends 9-3/4" from body and stands 6" tall from counter level. Very pleasant buying experience. Quick shipping too! Standard 4" centers so installation is (was) a snap. Much higher rise to outlet than previous faucet - which I like. Quality and appearance are very nice. Price and quality of product is good. The only drawback is that it is a 4 inch-on-center sized faucet. The large faucet handles give the spout limited range between the double sinks even with the "high rise" design. Overall, a good faucet for the recreational camper. I would not recommend a 4 inch center kitchen faucet for long term use, go to an 8 inch center if you can. We were limited to the 4 inch faucet by some factory equipment that was installed under the sink sidewall. Product easy to install, delivery was quick. Although the product easy to install and delivery quick, we have not used it enough to do diligence in rating the quality of the faucet.